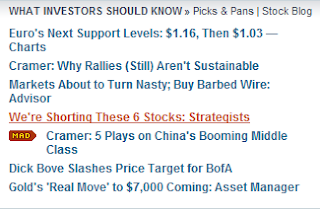 6 out of the 7 featured stories are bearish. 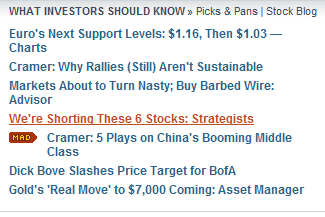 In late April when it was time to sell I am pretty sure most of the articles would have been bullish. I believe we will make more downside progress at some point but for now I believe that the downside is becoming a little too easy. I would tend to agree but, who's buying? It still feels like there are more sellers out there than buyers. All it would take is a cessation of the selling to get a lift. Once the market is higher people find a reason to chase. A Goldman settlement with the SEC could come in the next week as that is the deadline for their response to the complaint.. That could give the market a lift.